Drones already give some people the heebie jeebies, but strap a laser to one and it may be just too damn much to handle. Unlucky for those already wary of the tech, one company is developing laser-equipped drones, and it thinks it can get it done by 2017. These laser drones would be for military purposes, and there's a lot of obstacles to work through so that, for one, the laser beam is accurate. You can't just stick a laser on a drone wing and call it a day. "Before you spend any money on a laser you better darn well show that you can acquire, ID, and track the objects of interest so that you could put a laser on them," Michael Perry, vice president for Mission Systems at General Atomics Aeronautical Systems, Inc., the company developing the drones, told Defense One. "You have to be able to compensate for aero-optic distortion." The company also has to work through how much weight a drone can carry while still lugging a high-power laser. To that end, it plans to develop a laser system for the Predator-C drone, which has a payload limit of 3,000 lbs. Particularly intriguing about the work General Atomics Aeronautical Systems, Inc. is doing is that it developed a power system that takes energy from the aircraft, stores it elsewhere and uses the stored power to run the laser. If there is enough of an interval between shots, the laser never has to recharge. If it does, it can recharge in the air. 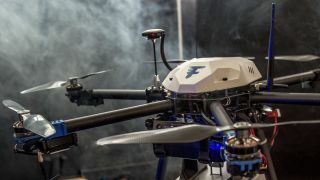 Laser-equipped drones certainly sound threatening, but Perry said the focus on the technology, at this point, is largely defensive missions, such as protecting forces that are being fired on. Ever wonder how drones work?